By the time war was declared in September 1939 Folkestone had its ARP system in place and everyone had been fitted with gas-masks. There had been black-out tests in July and people had been sent many leaflets of instructions. 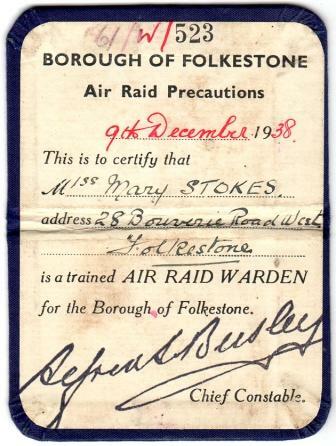 This is the ARP certificate showing that Mary Stokes was a fully trained Warden. Mary was the daughter of Robert James Stokes and Edith Cook, born 1903. 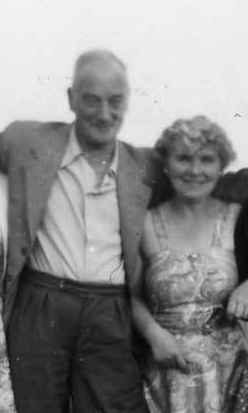 In 1951 Mary married Charles Braithwaite. Mary lived to the age of 94 and died in Subiton 1997. She had no children. Mines had been deployed along the coast and several washed ashore during the winter of 1939-40 which was particularly cold with heavy snowfalls and frosts. or they trawled, a mine. Frederick Weatherhead Snr, aged 68, skipper; Frederick Owen Weatherhead, aged 41, his son; Richard Cornish, aged 67 and William Foad, aged 48. The boat was owned by Mrs E May widow of Charles May. Drifting mines were a constant problem for shipping. They often broke loose during heavy seas. With thanks to Eleanor Ashby for this photograph. 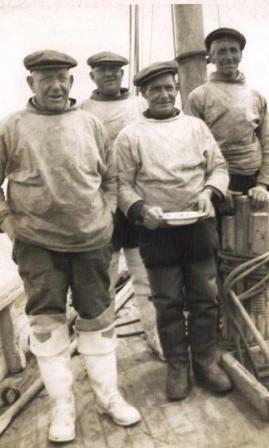 Is this Frederick Weatherhead Snr, Frederick Wetherhead Jnr, William Foad and Richard Cornish? I was 16 when the war started. At first not much happened. Refugees arrived from the Continent and children were evacuated from London to Folkestone as “A place of safety”. The town filled with service personnel. Saturday evening dances at the Leas Cliff Hall were full of them, but sometimes someone would suddenly appear at the entrance, there would be a signal, and they would excuse themselves in mid–dance and all disappear off on some alert! We all had identity cards. Folkestone was declared a “Garrison Town” and anyone could be challenged by a soldier with fixed bayonnet and you had to do it right. “Halt. Who goes there?” “Friend” “Advanced friend and be recognised”. They were very woried about spies so I was challenged several times while walking up to Capel to see my brother. 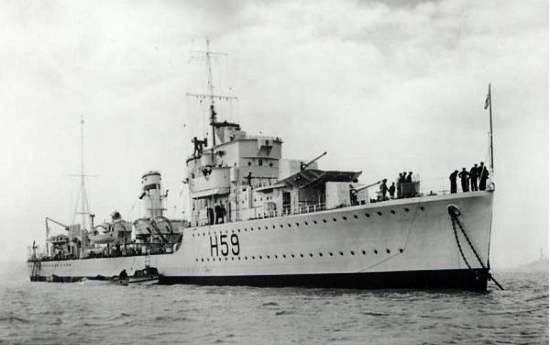 We used to watch the ships in The Channel, hoping to see my other brother′s ship, the destroyer H59, HMS Gallant. Gradually the situation got worse, many people left Folkestone if they could. The evacuated children went to Wales. Businesses started to close. I was an apprentice dressmaker at Bobby′s but with so many people leaving the shop closed the dressmaking, millinery and corsetry departments and my apprenticeship was ended. I moved to Upton′s as an assistant. At the end of May 1940 came the evacuation of Dunkirk. I think every boat from Folkestone went to help, big and small. Thousands were landed at Folkestone. I remember watching the trains cross over the arches by the harbour full of exhausted soldiers. Many threw letters out of the windows asking us to post them to their families. My brother Reg was at Dunkirk. He was a Petty Officer (later CPO) and gunner on HMS Gallant, H59. He was called “Dornier” Riddalls because he shot down the first Dornier aircraft when his fleet was attacked during WW2. 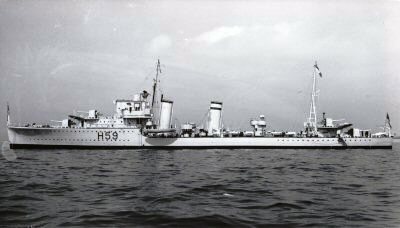 HMS Gallant made two trips to Dunkirk on 28th and 29th May 1940. On the second trip it was damaged when a bomb landed 10 yards from the stern. The Ship returned to Dover under its own steam but then had to be sent for repairs. HMS Gallant evactuated 1466 men from the beaches. HMS Gallant later served in the Mediterranean Sea but struck a mine 25 miles off Pantellaria on 10th January 1941. The explosion caused the bows to separate. 65 men were killed and 15 injured. Not long after Dunkirk my father decided I should leave Folkestone and join my mother and younger sisters in North London. I worked for Marks and Spencer at first but after call–up I learned Electric Welding and welded mostly Bofor′s gunsights and the reserve fuel tanks for aircraft at the Waverley Welding Co. Enfield. Folkestone was badly bombed during the war. Many houses and businesses were destroyed near the Harbour, Dover Street and Saffrons Place. Our house was one of these, but I think it was heavy shelling after the bombs which finished it off. I returned in 1943 to get married. We had to have special permission to travel. My parish church had been bombed so we married in my husband′s parish. That evening all the trains were halted and we had to go to the police station to get permission to stay an extra night. To my huge embarassment they took great pleasure in teasing the “newlyweds” and we had to stay with family and depart the next day! Two Landmines were dropped. One landed in Tolput′s Yard taking down the large chimney and damaging houses in Saffrons Place. The second dropped near the Harbour demolishing Saunders Chandlers, Charlie′s Restaurant and several other businesses. Also damage in Dover Street. Shelling commenced from the French coast and did the rest of the damage taking half our house, along with the rest of the houses in Saffrons Place. There were quite a few deaths but I don't know the number. 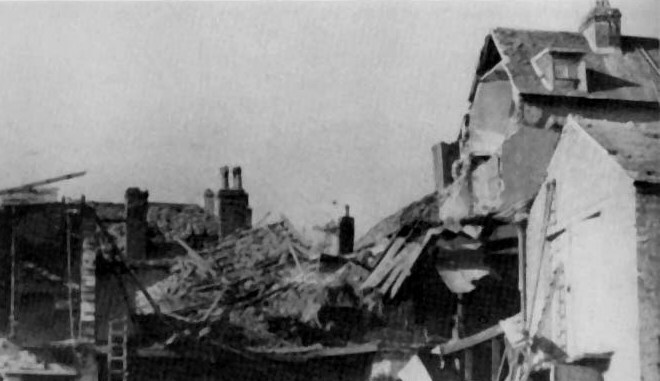 The picture here shows the house after shelling 9th Nov 1942. There is some question as to the above dates and years, but the writer was living in the house when the first bombing took place. My father was 17 years old soon after war broke out but, unusually for his age, he had learned to drive. Years later he told us that he had the job of collecting the “Big Wigs” from the station and taking them to the “Citadel” under Dover Castle. It was much later that the information concerning the passages under the castle was de–classified, and long after that I visited the castle, toured the underground passages and realised what he had been referring to. In May 1940 many children and their teachers were evacuated from Folkestone to Wales for safety because of the bombing and fear of invasion. This is the letter which went out to parents of school children on 27th may 1940. It was the Monday of the week of the Dunkirk evacuation. The invasion was expected at any time. In 1940 the Staff in Kent County Council′s Public Assistance Department in Bouverie Square were probably a little tired of form filling for permission to do just about everything so they produced this spoof application form as an in–house joke.